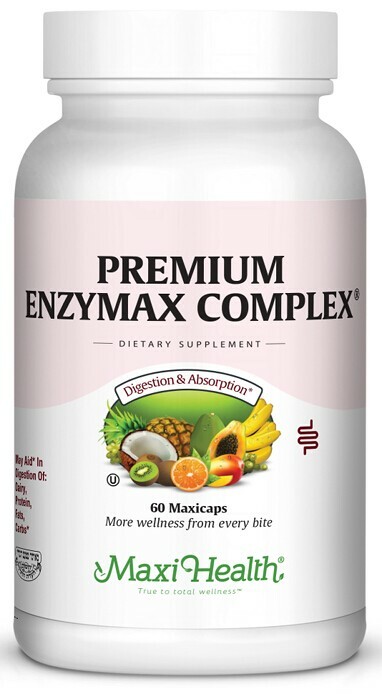 If you have been looking for a digestive enzyme formula, Premium Enzymax™ from Maxi Health has what you are looking for. Enzymes are responsible for the metabolic functions and are vital for life. These proteins catalyze, or accelerate all normal biochemical reactions and are highly specific regarding what they do and under what conditions they do it. Food is composed of protein, fat, carbohydrate, and fiber. Enzymes break down each of these into progressively smaller components until they reach their basic building block form. Amylase (helps digest starchy foods such as white breads, pastas, and potatoes) will randomly hydrolyze the interior alpha-1,4-glucosidic bonds of starch to release simple sugars for digestion. Supplemental amylase works synergistically with endogenous human amylase to digest starchy foods such as white breads, pastas, and potatoes. Invertase (helps digest refined sugars) catalyzes the hydrolysis of sucrose into its component parts D- fructose and D-glucose. This action helps in the digestion of refined sugars. Protease 4.5 (helps provide protein digestion) is a mixture of acid, neutral and alkaline proteases that demonstrates both exo-peptidase and endo-peptidase activity with high substrate specificity. Protease 4.5 works synergistically with endogenous enzymes to provide protein digestion in the stomach and pyloric regions of the small intestine. Glucoamylase (helps digestion of carbohydrates) will hydrolyze amylase, isomaltose and dextrins to release free glucose. This enzyme works synergistically with endogenous human amylase and supplemental amylase to potentiate the complete digestion of carbohydrate rich foods. Protease 3.0 (helps provide protein digestion) is characterized by its ability to hydrolyze proteins under acid conditions. The broad specificity of acid-stable protease enables the enzyme to, easily and efficiently, hydrolyze most soluble proteins. Lipase (helps digest fats and oils) catalyzes the hydrolysis of triglycerides of simple fatty acid esters, yielding free fatty acids. Lipase has broad substrate specificity on the fats and oils of both vegetable and animal origins. D Alpha-galactosidase (helps decrease gas) is characterized by its ability to hydrolyze the alpha-1-6 linkages in melibiose, raffinose, and stachyose, which commonly occur in vegetables and legumes. Neutral Bacterial Protease (provides protein digestion) is an endopetidase that hydrolyzes the interior bonds of most soluble proteins. Neutral bacterial protease works synergistically with endogenous enzymes to provide protein digestion in the pyloric regions of the small intestine. Lactase (helps digest the sugars found in milk and dairy products) is characterized by its ability to hydrolyze lactose over a wide range of temperatures and pH. Cellulase and pectinase is a complex composed of three distinct enzymes which convert cellulose to glucose. Peptidase (provides protein digestion) contains a very high level of exo-peptidase activity and is able to provide a high degree of protein hydrolysis without the formation of bitter products. Protease 6.0 (provides protein digestion) is a mixture of acid, neutral and alkaline proteases that demonstrates both exo-peptidase and endo-peptidase activity with high substrate specificity. Xylanase (reduces the bulking effect of fibrous foods) hydrolyzes xylans, indigestible components of plant fibers. Since humans lack the endogenous enzymes required to digest plant fibers, the supplementation of xylans provides humans with an additional source of nutrition and reduces the bulking effect of fibrous foods. CereCalase® is an exclusive blend of hemicellulase, beta-glucanase and phytase that is designed to synergistically disrupt the fibrous nature of plant cell walls and release trapped nutrients from plant materials. Maxi-Health Research® is proud to provide you with our most advanced enzyme formula. Premium Enzymax® Complex is professionally formulated to provide the highest quality plant and microbial enzyme formula. Take one (1) to two (2) Maxi-caps™ daily with meals, or as directed. Other Ingredients: Vegetable cellulose, magnesium stearate, rice flour. This product contains no animal products, wheat, gluten, yeast, soy, sugar, salt, milk, artificial flavors or colorings.